The ReWalk is a revolutionary exoskeleton that enables paraplegics to stand, walk, and even climb stairs. Designed by Argo Medical Technologies, the bionic suit enhances simple body movements in order to produce life-changing results. We have covered the ReWalk exoskeleton before, but this week Argo Medical Technologies and Cyclone Technologies announced that Claire Lomas has become the first person to take home an exoskeleton system for personal use! 32 year-old paraplegic Claire is from Leicestershire and was injured in 2007 during a horse riding accident which left her paralyzed from the chest down. 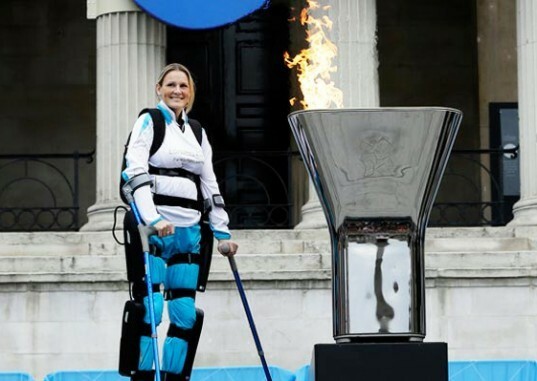 In 2012, she made a significant milestone when she became the first person in the world to complete the London Marathon in a bionic suit, raising more than £200,000 for spine injury research. Most recently, Claire was chosen to light the celebration cauldron in Trafalgar Square to kick-off the 2012 Paralympics in London. Claire will now to be able to stand, ascend and descend stairs and walk indoors and outdoors independently and on a daily basis. She recently completed training at Cyclone’s rehabilitation and training center using a ReWalk model made specifically for institutional use. Click below to watch Claire Lomas complete the London Marathon using the ReWalk.